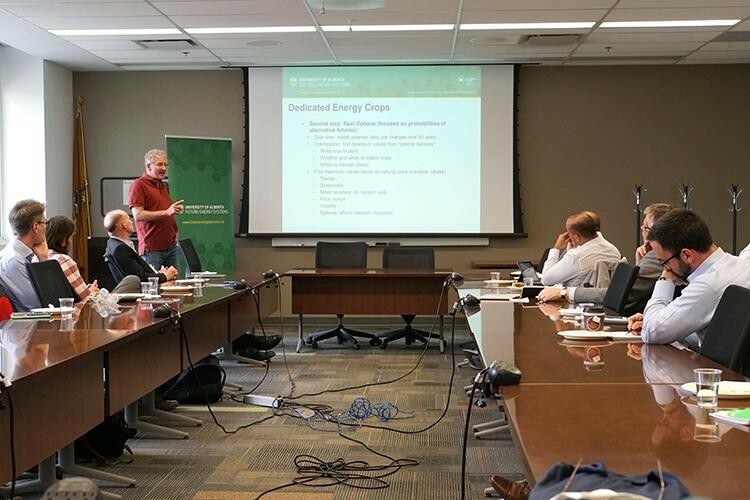 Future Energy Systems hosted its second Interdisciplinary Lunch-and-Learn yesterday, bringing together two Principal Investigators to discuss their methods for exploring the viability and potential impacts of new energy technologies. Systems Engineer Evan Davies began the session by explaining the Global Change Assessment Model (GCAM) that can simulate energy and agriculture changes worldwide to the year 2100. As part of the Future Energy Systems System-Wide theme, Davies will be enhancing the specific Canadian components of GCAM, enabling it to better reflect the country's geographic and energy realities. Using GCAM researchers run scenarios that predict the interaction of different factors, such as how new cooling technologies in the energy industry could impact global water use, or water use in specific jurisdictions like the United States. These 'what-if' simulations allow policymakers to explore potential unintended consequences, and find areas in need of more detailed, specific research. Resource Economist Marty Luckert works in the specifics. As part of the Future Energy Systems Biomass theme, his team is exploring the real-world practicalities of feeding a biofuels industry in Alberta with either agricultural crops or residues from the forestry industry. By studying the economics of transporting raw materials, and considering competing uses for those potential feedstocks, his team is developing an understanding how viable both current and new biomass technologies really are, and what level of government intervention might be required to make them economically palatable. Luckert's team also addresses the problem of variability of supply, acknowledging that the availability of biofuel feedstocks can be influenced by everything from weather to profitability, and that prices change over time. When costly new biomass energy systems are proposed, the reliability of their feedstocks will be an essential consideration for decision makers. These two approaches for assessing the viability of potential future energy technologies were presented to another full house of Future Energy Systems researchers and HQP, as well as interested audience members from outside the program. As with the first Interdisciplinary Lunch-and-Learn, this session set the stage for potential future collaborations. The next Interdisciplinary Lunch-and-Learn will take place in September. Subscribe for updates about that event –– and potential open-doors events in July and August!